That's that for this live too now. You can read Tom Garry's report of England's victory here. Thanks for joining me, catch you next time. Mark Sampson once again only used three substitutes as he attempts to replicate the feel of tournament football ahead of Euro 2017. Austria will be there too but England are likely to encounter much tougher opponents who will test their defence more regularly than the visitors did tonight. Plenty of positive signs though in an attack that looks capable of scoring after their recent trouble in front of goal. A comfortable win in the end for England in their final home game before the Euros this summer. A welcome confidence boost for Mark Sampson's side. Austria played their part but failed to trouble the England defence, while the hosts proved clinical enough in attack, despite the exploits of Manuela Zinsberger. Slightly ragged in the final stages but England holding firm at the back, looking to protect their clean sheet. England come forward, trying to put a bit more icing on this cake. Karen Carney plays in Jordan Nobbs but Katharina Naschenweng does well to come across and prevent another chance on goal. Four minutes of added time at Stadium mk. That's more like the margin of victory that this dominant England side have deserved in the second half. 2-0 was slightly flattering the Austrians, who have been second best. That was the last act for Christiansen as she's instantly replaced after the celebrations end. Jill Scott is on for the final stages. From the corner, Steph Houghton rises highest to head it goalwards and Izzy Christiansen gets the faintest of touches as the ball squirms through Manuela Zinsberger into the bottom corner. It's not clear at first if Christiansen gets a touch at all but it appears to flick off the back of her ponytail on the way through. Zinsberger should probably do better with it, though that's perhaps harsh after her exploits all evening. Poor defending from those in front of her. Top work from Karen Carney, slithering her way past three markers on the left and squaring the ball, which is awkwardly put behind by the Austria defence for a corner. 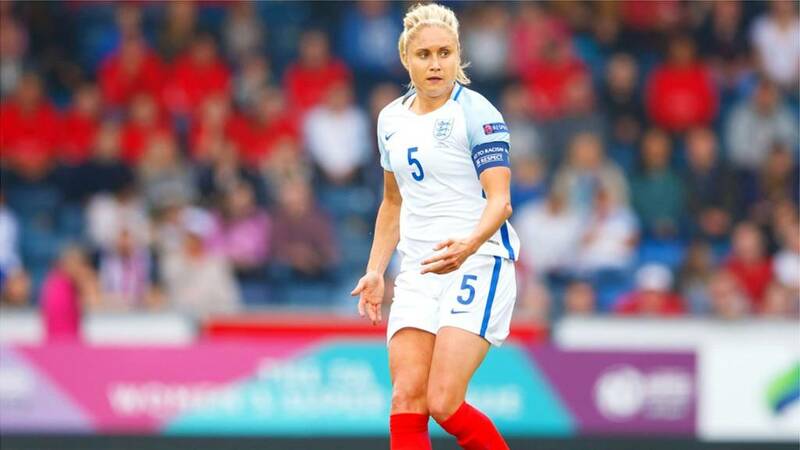 Skipper Steph Houghton clips a free-kick from deep towards Jodie Taylor but the substitute can't gather to fashion a chance. Siobhan Chamberlain is down...but it's just to tie her laces. Does she not know that can get you a yellow card? Or at least it can if you're Neymar. It's all very comfortable now for England as Austria's cross routinely fall to players in white. And that's Aschauer's last play of the game as she's replaced by Barbara Dunst. Nothing doing from the corner that Aschauer won as England clear. Verena Aschauer shows some fancy footwork to nutmeg Steph Houghton but England's defence rally to clear the ball out for a corner. Lovely flick-on from Nina Burger almost falls to Verena Aschauer in attack but England stay strong to wrestle the ball off her and clear. Karen Carney is allowed to turn and finds Jodie Taylor with a long ball forward. It's worked right finally to Lucy Bronze, whose first-time cross is well cleared by Viktoria Schnaderbeck. Enterprising stuff from the hosts though. Katarina Naschenweng is on for Austria in place of Lisa Makas. England also make their second sub as Jodie Taylor - who scored against Italy - comes on for one of tonight's goalscorers Ellen White. England sense they can kill Austria off here as Ellen White is played in by Karen Carney to unleash a powerful drive that is well saved yet again by Manuela Zinsberger.